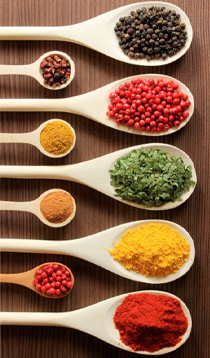 Spice Enthusiast is located in the windy city of Chicago, Illinois, but we source the finest ingredients from all over the world to provide the most pungent and flavorful products. We are a leader in natural and organic productions. In addition, most of our products are Kosher and Gluten Free. We are your online source for exotic and hard to find ingredients for cooking and baking. Experience ingredients that have journeyed to your plate from all corners of the world: from the Indian spice markets filled with intoxicating scents and brilliant colors to the Sava region of Madagascar where beautiful Vanilla Orchids are painstakingly hand pollinated to produce the coveted vanilla bean. Spend less time searching for expensive herbs and spices at your local grocery when you can find everything you need right here. Whether you need just a pinch or more than a pound, all of our products ship free! We are not just a website. Our live customer service team is dedicated to providing quick and accurate information regarding products, availability and delivery. Contact us anytime! Our customers have the advantage of purchasing products developed by the best in the business. We have assembled a nationally renowned Research & Development team. Our unique relationships with industry leaders and ingredient manufacturers enables our company to offer innovative products. Spice Enthusiast currently offers thousands of products on our website and we are adding new dried spices, seasonings, herbs and other products all the time. You have access to our wholesale herbs and spices at discounted prices. Our spices are packaged fresh daily. Spices from the grocery store have been sitting in a container for months and moved from warehouse to shelf. You order your spices from us and we package these fresh daily at the time of your order.